If you are missing teeth, our dentists may recommend replacing them with dental implants or dentures. Once we assess you teeth, our team will make a recommendation that is best suited to your needs. Dental implants are artificial tooth roots. Implants can be used to replace a single missing tooth, multiple missing teeth, or to support a denture or bridge. Eliminates further bone loss in most circumstances: Typically, our bodies maintain the bone in the area around the tooth. If teeth are missing anywhere in the jaw, the bone will slowly disappear. When your doctor places an implant in your jaw bone, it stimulates the bone and your body will continue to maintain the bone in that area, similar to your natural teeth. 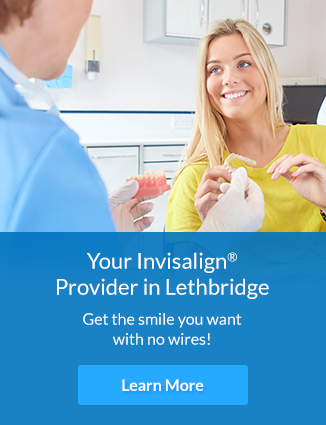 No change to healthy teeth: Unlike dental bridges, your remaining natural teeth do not need to be prepared, or changed prior to or during this procedure. Periodontal disease: Implants can be less prone to gum problems than natural teeth. In cases where people have lost some or all of their teeth due to gum disease, implants can be used to replace the missing teeth. Because the offending tooth or teeth are removed, the environment in the area improves and you have a second chance at healthy gums. Proper home and professional cleaning is still very important for long term health. Improved appearance: Implants are designed to blend with your mouth, creating an attractive smile. An implant supported denture is held in place by implants and can be removable or fixed. Removable dentures have 'clips' fitted into the denture itself, allowing you to take the denture on and off to clean it. A fixed denture functions much like a permanent bridge or like dental crowns, and is permanently attached to the implants or a bar that sits on top of the implants. Our practice will work with you to provide the most suitable treatment plan along with home care instructions and follow up appointments so your dental implant(s) can last for many years to come. For more information on our dental implants, or how you can get them, contact our office today! Our friendly team will work with you one-on-one to create a personalized treatment plan to suit your needs. Looking for a new, healthy smile that you love? Let's talk about your options!